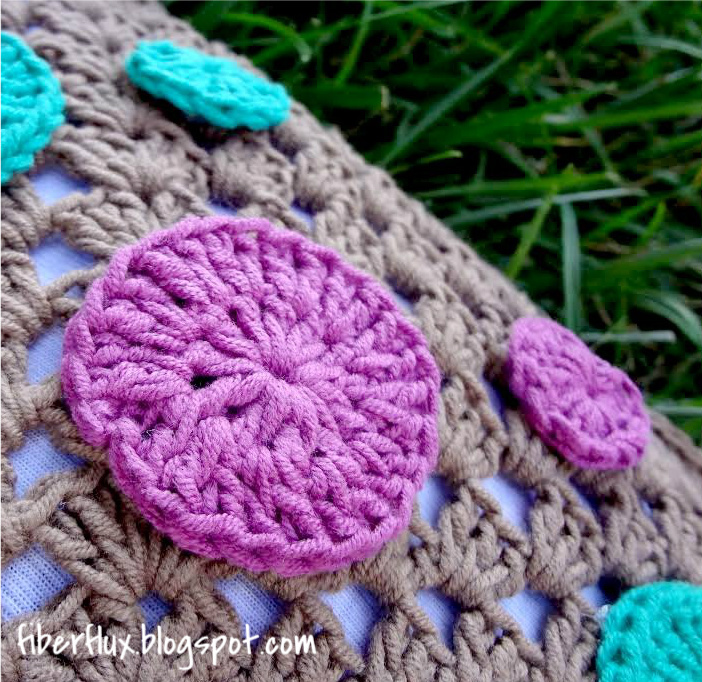 Fiber Flux: Free Crochet Pattern...Dotty Throw Pillow! 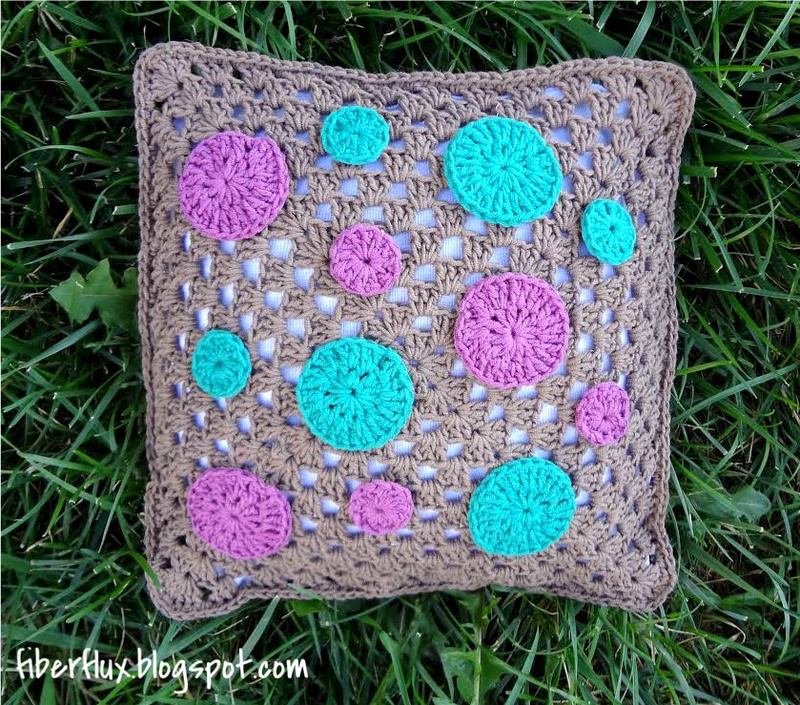 Free Crochet Pattern...Dotty Throw Pillow! Last summer, a throw pillow I designed was published on the Stitch & Unwind Blog. I loved using the yarn and wrote a review on it as well, and now the pillow pattern in full is available here on Fiber Flux too! The Dotty Throw Pillow has both modern and vintage appeal. 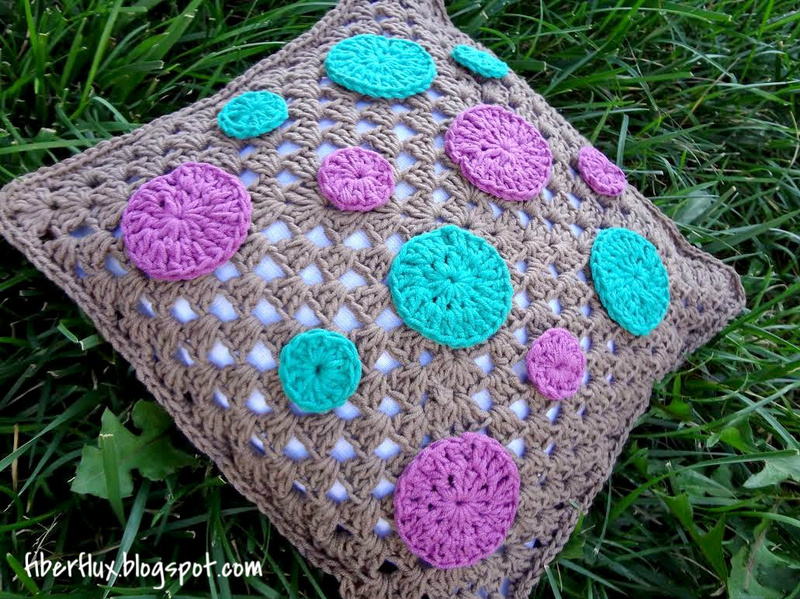 Two granny squares make the body of the pillow, and polka dots in multiple sizes add a fun embellishment. Soft and comfortable cotton yarn make this pillow pretty and perfect to cuddle up to! Pillow shown is a 12 inch square. However, you can make your pillow as large or as small if you like by simply working more or less rounds of the granny square. Round 2: To work the corner of round 2, first chain 4, then 2 dc in same space, then chain 1, then 3 dc in the same space. Chain 1, then work the next corner by working 3 dc in next space, chain 1, then 3 dc in same space, chain 1, repeat two more times to complete the round. Keep working in this manner, with two clusters in the corners and one cluster on the sides until you finish the round. Just be sure there is a ch 1 in between each grouping of 3 dc as you work each round. Repeat round 3 until your square measures 12 inches across or 24 inches across depending on what size you prefer. To begin a new round in the same color, simply slip stitch until you reach a ch1 at the corner and begin the new round. To begin a new round in a new/different color, cut yarn, leaving a tail, and fasten it with a slip stitch. Join the new yarn at one of the corners as shown and tie securely. Continue to the next round. Ch 4 and join with a sl st to form a ring. Work 12 dc in the center of the ring. Ch 3 and work a dc in the first space. In the next space, work 2 dc. Continue around the circle by working 2 dc in each space all the way around. Join to close circle with a sl st. Attach dots to granny squares by seaming them on with a tapestry needle and a length of same colored yarn. Or if you prefer, you can attach the dots to the pillow with some fabric glue instead. Weave in all ends of the squares. Stack the two granny squares with right sides facing out. Fasten the same colored yarn in the corner of both squares. Seam together by working a single crochet in both loops of both squares on three sides of the squares. Place pillow form inside and continue to join the squares together to close the top of the pillow up. Fasten off and weave in ends. The dots are so cute! I haven't mastered a square in double crochet yet ( can never figure out where the last stitch is, so my sides are all wonky ) but I am getting the hang of circles. Now I feel the need to go put circles on things. Would be cute as a skirt edging too if you added an embroidered stem, you could have flowers for Spring! I love this pillow, going to try it.